"A Place for Lovers" is the most godawful piece of pseudo-romantic slop I've ever seen. I did see it. Yes. I sat there in the dark, stunned by disbelief. Could Vittorio de Sica possibly have directed it? De Sica, who made "The Bicycle Thief"? Even a director who had made no movies would have a hard time making one as bad as this. 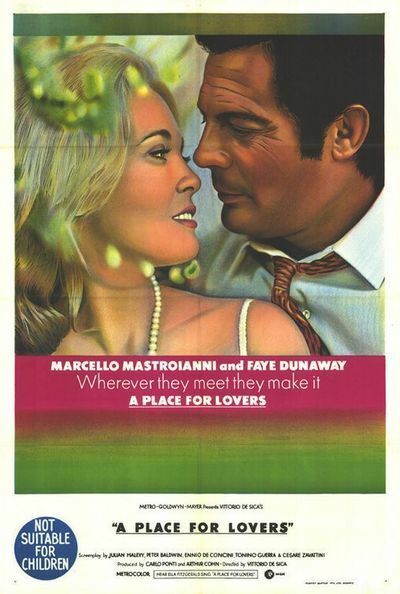 It is about a beautiful woman (Faye Dunaway) who has an incurable disease and takes up with an engineer (Marcello Mastroianni) who designs big plastic bags of water that are supposed to bring an end to race-track accidents. They go up to a ski lodge and ponder at each other. Ponder, ponder, ponder. When Faye gets all pondered out, she takes the Jeep and drives into town to enigmatically threaten suicide. But she never kills herself, alas. Instead, she lingers on during some of the most incredibly static scenes ever put on film. There's a by-play involving a stray dog that she rescues from the dogcatcher and then (apparently) abandons. Either she abandons the dog or the script does. The screenplay was written by no less than five writers, who were possibly locked into separate rooms and forbidden to communicate. One goes to this movie in the same spirit one visits an ancient town buried by lava centuries ago: To try to determine by examining the ruins what made the gods punish man so.